A mix of peanuts and raisins with milk chocolate coated peanuts. Unsalted A carefully selected mix, with crunchy peanuts coated in milk chocolate; We ethically source our nuts from all over the world. Our growers carefully check every batch for size and quality, for you to snack, share and enjoy. 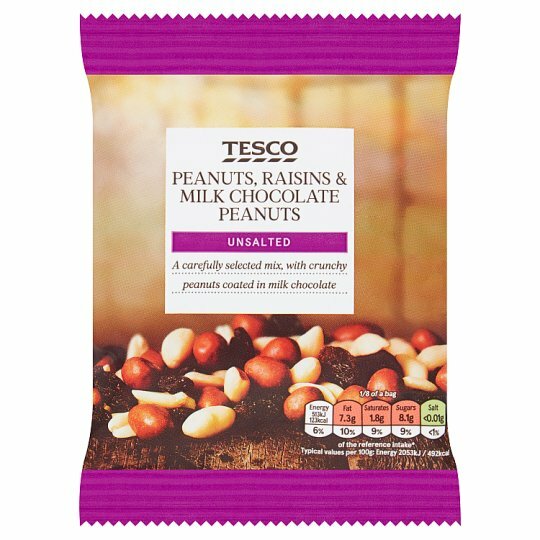 INGREDIENTS: Peanuts (42%), Raisins (33%) [Raisins, Glazing Agent (Sunflower Oil)], Milk Chocolate Coated Peanuts (25%) [Peanuts, Sugar, Cocoa Butter, Dried Skimmed Milk, Cocoa Mass, Whey Powder (Milk), Rapeseed Oil, Milk Sugar, Butteroil (Milk), Glazing Agents (Acacia, Shellac), Tapioca Starch, Emulsifier (Soya Lecithins), Flavouring]. Allergy Advice! For allergens, see ingredients in bold. Also, may contain other nuts.